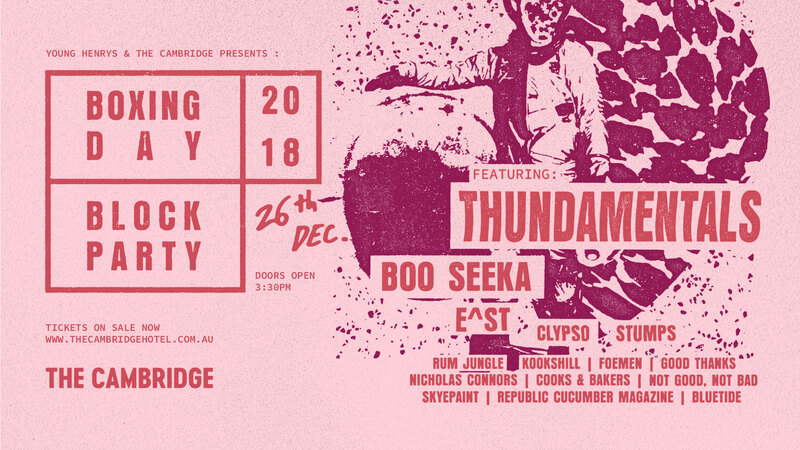 The Cambridge Hotel & Young Henrys Present: Boxing Day Block Party ft. THUNDAMENTALS, BOO SEEKA, E^ST, CLYPSO, STUMPS + Rum Jungle, Kookshill, Foemen, Good Thanks, Nicholas Connors, Cooks & Bakers, Not Good Not Bad, Skyepaint, Republic Cucumber Magazine, Blue Tide + more! The party is spread across the entire venue w/ Main Stage located outside in our car park. Let's shut this block down.